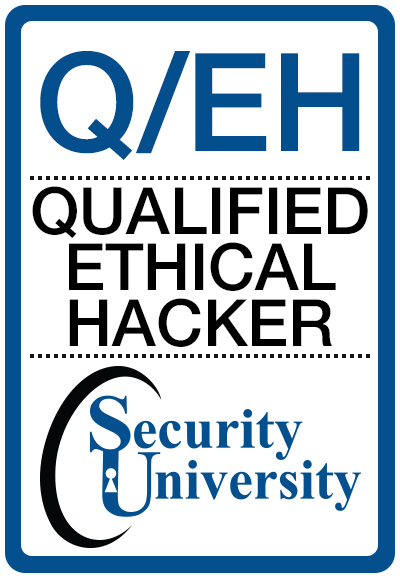 Q/EH ® , Q/SA ®, Q/FE ® , Q/ND ® identifies and certifies persons who subscribe to a rigorous requirement for maintaining their knowledge and proficiency with validated cybersecurity skills. SUT Q/ISP and related Q/EH, Q/SA, Q/FE, Q/ND micro badge certification program has been created for Information Security Professionals including, Cybersecurity Professionals, Network Engineers, Vulnerability and Threat Analysis Professionals, Computer Network Incident Handling and Incident Responder Professionals, Computer Security Incident Response Team (CSIRT) members, Network Security Architects, Network Cyber Defenders and technical staff including system and network administrators with cyber security experience who want to earn a CyberSecurity Skills Certification. 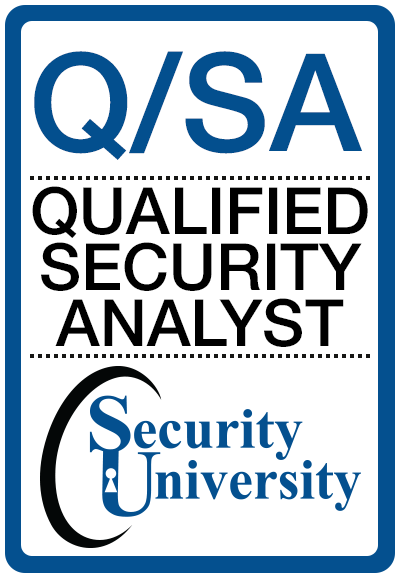 The SUT Q/ISP certification is recommended for computer security professionals with a minimum of 6 months of experience in network security or equivalent security-related experience. Ensure that their organizations stay current on recent threat risk, and threat reduction and security innovations/ research in the computer security field. There is no particular order in which SUT Q/ISP certifications should be earned, however we recommend that candidates start with a review of the Q/ISP certification objectives and topic areas which are outlined for each of the four Q/ISP certification exams. Once an individual earns a SUT certification, he or she can build upon this knowledge of tactical security skills by focusing on the three remaining SUT Certifications to ultimately earn Security University's Certification. Students who earn their Q/ISP are Highly Qualified Experts who have earned SU's CyberSecurity Master Certification or SU's Information Security and Information Assurance Graduate Certification (provided they have a Bachelor's Degree from an Accredited University program). Earning a SUT Q/ISP certification requires passing four proctored certification exams (Q/EH, Q/FE, Q/SA, Q/ND) and completing three hands-on Q/ISP practical's (Q/PTL, Q/FE, Q/ND). SUT certifications assure that an individual has learned the tactical real-world cybersecurity skills covered by specific related Q/ISP certification objectives. Experience in the specified certifications qualifies as security experience but does not qualify as validated hands-on professional experience which can only be achieved from providing the required Certification Practical. Non-professional work, even in the applicable certifications does not satisfy the Q/ISP validation requirement. Professional work is compensated by salary, retainer, fee, or commission or pay by per hour. SU does not exempt wage and hour workers from SUT Certifications. 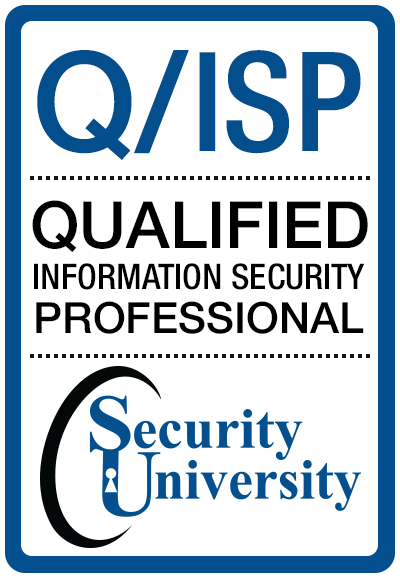 Registered for the Q/ISP certification as a Security University Testing candidate or have passed the following exams with a 70% or better (Q/EH, Q/SA Q/PTL, Q/FE, QND) content or complete the Q/EH, Q/SA, Q/FE and Q/ND Certification exams with a 70% pass or better AND complete the Q/PTL, Q/FE, Q/ND hands-on tactical Security Practical reports. Candidates should ensure that they prepare appropriately for questions in the exam content areas listed below. The Q/ISP examination tests the candidate with regard to the competency and skills required to successfully perform the role of a Qualified/ Ethical Hacker - Security Testing Tools. The subject matter covered on the certification exams falls into five major weighted content area groupings, as follows. Exam Content Areas: The Q/ISP examination tests the candidate with regard to the competency and skills required to successfully perform the role of a Qualified/Security Analysis and Q/PTL Penetration Tester. The subject matter covered on the certification exam falls into five major weighted content area groupings, as follows. Exam Content Areas: The Q/ISP examination tests the candidate with regard to the competency and skills required to successfully perform the role of a Qualified/Forensic Expert. 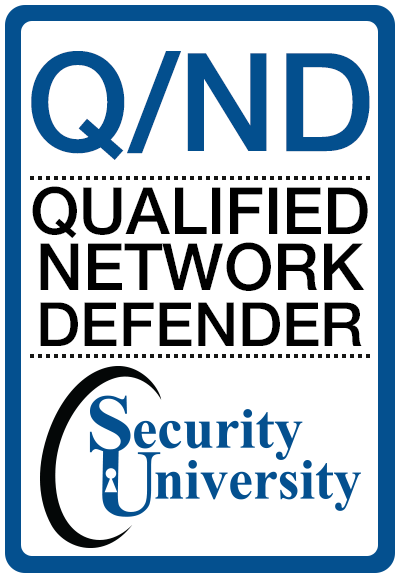 The Q/ISP examination tests the candidate with regard to the competency and skills required to successfully perform the role of a Qualified/ Network Defender. The subject matter covered on the Q/ND certification exam falls into five major weighted content area groupings, as follows. A certification is proof an individual meets a minimum standard. The mission of SUT is to provide assurance to employers their people and prospective hires have qualified and “validated” cyber security skills to do the job of a cybersecurity professional. To accomplish this, SUT tests the tactical hands-on security skills of Security Testing (Ethical Hacking), Security Analysis & Penetration Testing, Forensics and Cyber Network Defenses of a CyberSecurity Professional. The primary goal of the Q/ISP Qualification program is to qualify and validate the skills of IS/IA security professionals and software developers. Q/ISP certification provides assurances that a certified individual meets a minimum level of cyber security hands-on skills necessary to do their job. 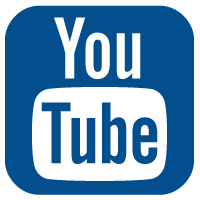 The standards for the Q/ISP certification program were developed using the highest benchmarks in the industry. What are the Benefits of Obtaining Professional Certification? Certification provides employers and consumers with an assurance that the qualified individual has attained a highly defined level of understanding or ability against a particular skill set or body of knowledge, and will maintain that level of expertise over a specific period of time. The certification renewal requirement ensures that certified, qualified and validated individual continually maintain and expand their knowledge and skills in the profession while keeping informed of advancements and updates in their field. Certification is required for employment in some professions, whereas in other fields, certification and qualification provides a competitive advantage to individuals who hold a particular credential. Security University a wholly independent company offers singularly unique computer cybersecurity, IS and IA training and certification classes with escalating workshops and tactical security performance based hands-on labs that validate the professional's security hands-on skills. 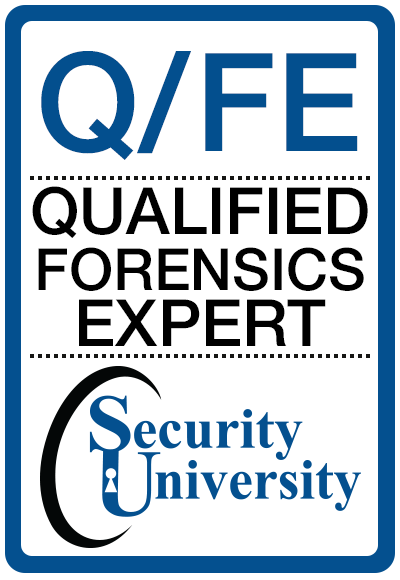 A SU "Qualified" certification is validation that an individual has met the Q/ISP tactical security standard and is the only certification to provide validation to employers that their people and prospective hires are "Qualified" in that specific security skill. We judge our success through our ability to provide the highest-quality hands-on Information Security Certificate/ Qualifications, as perceived by our customers, while achieving a steady growth in revenue and profit, and providing our personnel with the opportunity for individual development and achievement.